Soon after the development of the first laser, the ruby laser, there was a flurry of studies evaluating it for medical applications. The initial use was in the fields of dermatology and ophthalmology due to the unique feature of laser wavelength to be selectively absorbed by specific tissue color. However, effects on vascular tissue soon followed. The development of flexible fiber optic cables that carry the laser over distances made it possible to deliver high energy wavelengths through catheter systems deep into the arterial system via percutaneous methods. Continuous wave laser systems (i.e., argon and Nd-Yag) were initially used but were fraught with arterial wall perforation. However, pulsed laser systems (i.e., Ho:Yag and excimer) provided higher precision cutting and became more widely accepted. The effect of shock waves in tissues generated by collapsing microbubbles were reduced by using saline to displace blood in the field and increasing the duration between pulse deliveries. The advantage of lasers in the arterial system is its ability to cut through calcific plaques and recannalize long arterial occlusions. That is especially well suited for the peripheral arterial circulation. In the coronary circulation left main lesions and thrombotic lesions are also well suited for laser therapy. 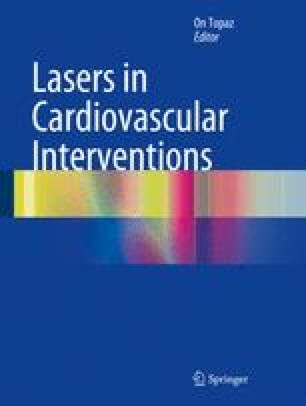 This chapter describes the evolution in the use of lasers in the arterial circulation and the current comeback in their utilization.